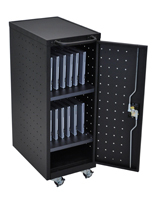 Need a way to store and power handheld devices? 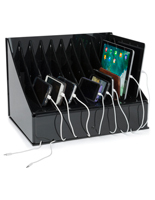 Use a tablet charging station to hold a wide variety of electronics. With a cabinet, users can keep their notebooks, Chromebooks, phones, phablets and more powered with their many USB ports. 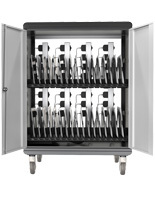 The tablet charging station, or iPad docking cart, features an internal power strip can support between 8 and 42 different gadgets depending on the model. Some of the laptop chargers feature a secure design with locking doors that prevent theft. 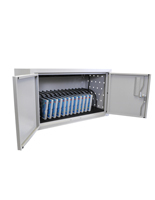 The tablet charging stations are available in different styles to meet the needs of any user. 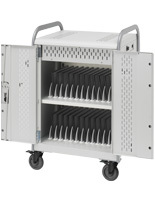 What features come with these iPad docking carts? These tablet charging stations are made with a mobile design that allows them to be moved between different rooms. Each of the movable laptop chargers features four caster wheels that makes movement a breeze. 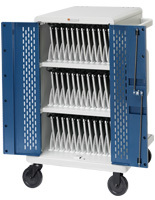 iPad docking carts are typically larger and feature more space for devices and available USB ports. 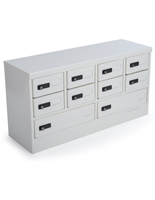 These cabinets feature an ergonomic handle for easy transport. Tablet charging docks are also sold in a simple countertop model that can be placed in more accessible areas like desktops and tables. 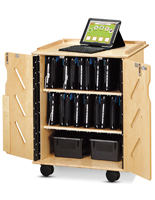 In addition, some holders for touchscreens and Chromebooks can be mounted to walls, freeing up floor and counter space. Many of the charging stations feature a door that locks with a key for keeping devices secure. Users won't have to worry about their valuable phablets and Chromebooks being stolen or tampered with even when placed in public areas. Some of the laptop chargers have an open design and do not have a secure locking mechanism, allowing for quick access to electronics. For extra security, some models of the charging station come with a RFID cards and a compatible reader for a digital anti-theft system. 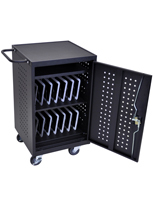 The iPad docking carts are each equipped with small holes for ventilation, ensuring that devices won't overheat when plugged in! 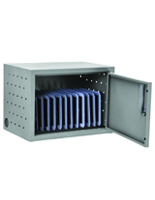 These openings are small enough to allow heat to dissipate, but small enough that Chromebooks, phablets and e-readers will remain secure. 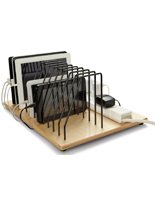 This type of tablet charging dock is a great addition to any school, office, lab, manufacturing or retail environment. 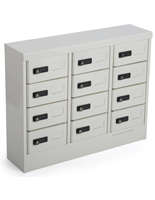 With their many USB ports, the locking cabinets can accommodate devices from a wide variety of manufacturers. The versatile design is made to keep up with technology developments while keeping phones, phablets and even drawing pads powered. In public areas, locking trolleys are an ideal choice, because they allow these gadgets to be carted from room to room with ease, while keeping them safe from theft, tampering, or damage.